The dress belonged to my paternal grandmother, for whom it was custom made in Rochester, NY, in 1951. Unfortunately, my grandmother doesn’t recall the name of the shop that designed and made it for her, and it has no tags. I’ll be the second person to ever wear it (as my grandmother only had one daughter, who had her own dress). It originally had a full crinoline and veil with it as well, but they have been lost over time. After my grandmother wore it, she had it cleaned and my grandfather built her a waterproof storage box to keep it in. 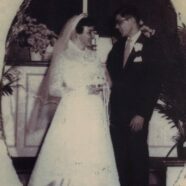 The dress followed them across country when they moved from Corning, NY to Santa Maria, CA. My grandmother eventually moved to Idaho, while my family stayed in CA. I was born and raised in CA, but eventually, as serendipity would have it, I wound up going to school at the same college in Rochester my paternal grandfather graduated from in 1948. The history of the school, and the fact that my grandmother’s wedding gown was made in Rochester, was unbeknownst to me when I decided on attending college there. So both the dress and my winding familial history will all have ended up quite neatly by the time I am married this summer–at my father’s alma mater here in California, no less! 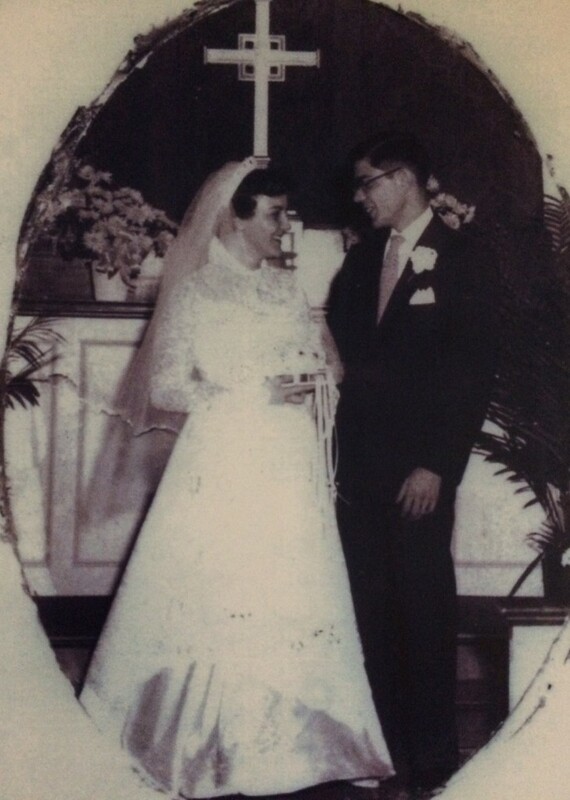 Photo of Grace’s grandmother wearing the custom-made wedding dress on her wedding day. Thanks so much for sharing your story with us, Grace! Want to read more wedding gown stories like Grace’s? Read more here.